6 November 2001 -- Robert Lang is an internationally recognized and award-winning documentary television producer/director, the president of Kensington Communications Inc with more than 25 years of production experience. Taking on gripping topics in science, the environment and social issues, providing performing arts programs and musical specials, Lang's work is very impressive. Since the 1980's Lang has worked with Bruce on projects ranging from public service announcements for USC Canada to a documentary on his trip to Nepal. He traveled to Mali to produce the innovative River of Sand project on desertification and now is working on 'The Life and Times of Bruce Cockburn' for CBC TV, which will be aired on 27 November 2001. When interviewed, 2 November 2001, Mr. Lang responded candidly and shared his thoughts on working with Bruce over the years. "Bruce and I have shared a long-standing interest in and support for the development work of USC Canada. In the late 60s, as a teenager, I helped the Montreal volunteers packing and hauling crates of clothing that were sent overseas to people in need. In the early 80's (I cannot remember what year exactly), being a filmmaker, I offered to do USC's TV Public Service announcements for them. These involved Bruce as the spokesperson for USC. We continued doing 4-5 of them every year since then right up until last year. In addition, we worked together in 1987 (1988?) on a 20 minute video journal of Bruce's trip to Nepal for USC, called Path to Nepal. 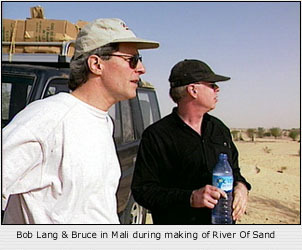 Then as you know we did the 1998 River of Sand film and website in Mali." The River of Sand project provided a unique opportunity for visitors to the website to ask questions of the team members and interact in a very meaningful way. Lang was asked how that idea germinated and what special technology did he put into place to make it happen? He responded, "I had produced a one minute spot for USC on desertification with Bruce. It received lots of attention. When the opportunity arose to do something more in depth about the problem of desertifiication in Africa, I developed the TV project that became River of Sand, financed with broadcaster pre-sales and the Canadian International Development Agency. The website became integral to the project as an innovative way to spread the ideas to a different audience than we would reach with the TV program. I like to experiment with new approaches and I had been thinking for some time about how to use the potential of interactive media in an engaging way. A very creative friend, Al Booth, wanted to design the interactive website despite the fact we had almost no money to do it. He was the driving force behind it. We took a battery powered satellite phone with us and we called in each evening from wherever we were in Mali to answer questions which had been emailed in by the participants. We also sent daily journal entries so that people could follow our journey overland from the capital city Bamako up to Timbuktu and south into Dogon country." Turning attention back to the Life and Times project Lang was asked where the filming for this current project took place and why those places were chosen. Lang noted that they shot footage in Toronto, while Bruce was moving, recording and in concert; Ottawa, where his parents live and where his career started; Montreal, which is his new home and where his daughter lives; Vermont, where a good friend lives and in New York during a recording session with innovative jazz pianist Andy Milne.